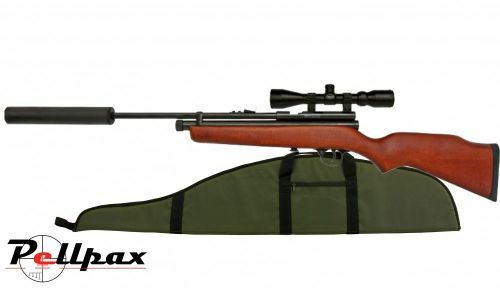 This is another very special price for this top quality combination air rifle kit. Chambered in the larger .22 calibre, the Super Stealth Rat Controller is based on the top selling XS78 Co2 Bolt Action Air Rifle and we are also including a 4x32 scope & mounts. But the icing on the cake is the Back Draft Silencer which reduces the muzzle noise of the air rifle to whisper quiet levels. We are also adding free of charge 10 Co2 Capsules and 250 Pellets, and of course the scope will be fitted and zeroed by us in our warehouse. This package also includes a fully padded gun bag, everything you need to start shooting as soon as we deliver it to you.